Sect is a technical term that is used in astrology in order to refer to a distinction between day and night. In practice it is used to associate different planets or different parts of an astrological chart with either the day or the night. The word sect is a literal translation of the original Greek term for the concept, hairesis (αἵρεσις), which was used to refer to a philosophical “school” or a religious “sect”. It implies the notion of a group or faction of people who adhere to a specific doctrine. Within the context of astrology, the doctrine of sect is used in order to divide the planets into two “teams” or “sects”. There is the daytime or diurnal sect which is led by the Sun, and then a nighttime or nocturnal team which is led by the Moon. The other traditional planets are then divided between the day and night sects, with Jupiter and Saturn joining the Sun as daytime planets, and the Venus and Mars joining the Moon as nighttime planets. Mercury is said to be neutral, and capable of joining either sect depending on certain conditions. The concept of sect can also be applied to other parts of the chart in order to assign different sections to the day or night. One example of this is to the signs of the zodiac. 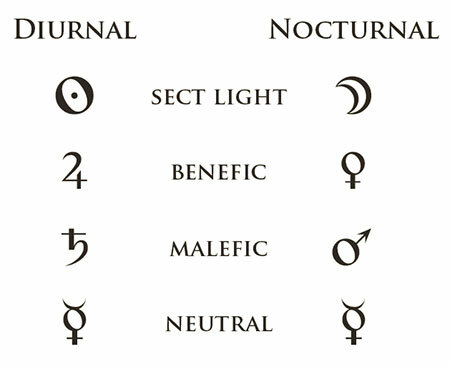 In some authors the masculine signs are conceptualized as being diurnal, while the feminine signs are conceptualized as being nocturnal. Sect can also be applied to the houses, so that one side of the horizon is conceptualized as diurnal, while the other is conceptualized as nocturnal. Sect is primarily used in order to make qualitative distinctions between chart placements, by altering the benefic or malefic quality of a planet based on its sect-status in a given chart. According to this doctrine, planets are capable of acting in a more positive or constructive fashion when they are in a chart that matches their preferred sect. Conversely, planets are thought to act in a more negative or destructive fashion when they are in a chart that does not match their preferred sect. The concept of sect appears to have originated in the Hellenistic astrological tradition around the 1st century BCE. The concept remained very popular throughout the Hellenistic tradition, and well into the Medieval period. It seems to have suffered a decline in usage after the Medieval period, and then it was completely forgotten about by the 20th century. In the late 20th century it began to be revived as a result of a renewed interest among some practitioners in traditional astrology. Chris Brennan, The Astrology of Sect, The Horoscopic Astrology Blog, November 25, 2008.